Middle East Broadcaster SAT-7 Addresses the Educational Needs of Refugee Children and Mental Health Needs of the Region by launching SAT-7 ACADEMY, a new channel aimed to inspire impactful, life-long learning across the Arabic speaking world. 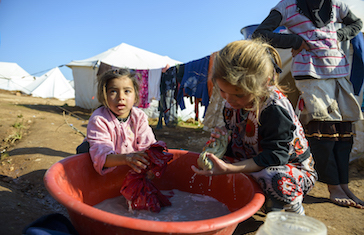 The magnitude of humanitarian needs in the Middle East is overwhelming. The Syrian conflict turned civil war, which began in March 2011, has displaced nearly 13 million people. 6.1 million people were forced to flee their homes and 4.8 million refugees are living in Turkey, Lebanon, Jordan, Iraq, and Egypt. Children and young people comprise more than half of the displaced population. According to the United Nations High Commissioner of Refugees (UNHRC) more than 2 million children under the age of 18 have been registered as refugees—forty percent of which are under the age of 12. Yemen remains gripped by uncertainty after the assassination of the former President Ali Abdullah Saleh and a spike in brutal violence has devastated the country. Over 17 million Yemenis (close to two-thirds of the population) are food insecure while a staggering 8.5 million people are on the brink of starvation. The United Nations Children’s Fund (UNICEF) warns that more than 11 million Yemeni children—almost every single Yemeni boy and girl—are in acute need of humanitarian assistance. And in Iraq, after years of conflict with Da’esh, the ambiguity over the legal age of marriage continues to threaten the protection of boys and girls already exposed to armed conflict. Upon arrival in countries of first asylum, children have encountered various disruptions and barriers to receiving adequate mental healthcare and education. The United Nations estimates that approximately 50 percent of refugee children were not enrolled in school. Recent studies by the Migration Policy Institute suggest that the enrolment rates of school-age refugee children are an estimated 20 percent in Lebanon, 30 percent in Turkey, and 68 percent in Jordan. Enrolment rates vary significantly across settings and by gender. For instance, girls are far less likely to attend school than boys. Even when they do enrol, refugee children are more likely than their non-refugee peers to receive poor or failing grades, or to drop out. Children may struggle to bridge gaps in their learning after substantial educational disruptions, particularly when contending with language barriers or new curricula. Perhaps even more importantly, refugee children are also at risk of a range of mental health issues resulting from their traumatic experiences. According to Selcuk R. Sirin, an Associate Professor in the Department of Applied Psychology at New York University, particularly Syrian refugee children are at risk for a range of mental health issues, having experienced very high levels of trauma. A 2015 study revealed 79 percent had experienced a death in the family; 60 percent had seen someone get kicked, shot at, or physically hurt; and 30 percent had themselves been kicked, shot at, or physically hurt. Almost 50 percent displayed symptoms of post-traumatic stress disorder (PTSD)—ten times the prevalence among children around the world. Meeting the mental health and educational needs of refugee children requires a substantial international commitment of resources for countries of first asylum like Jordan, Lebanon, and Turkey, and ongoing support for the small percentage of children who are resettled. Stressors associated with resettlement—such as economic hardship, language barriers, social isolation, and discrimination—can have further negative ramifications for academic and mental health outcomes. The International Medical Corps (IMC), which provides psycho-social support for refugees in Lebanon, Jordan, and Turkey, states that people with untreated mental health issues could lose their ability to function in society. Children may drop-out of school and fail to acquire skills needed to prosper in life. As the refugee crisis continues to unfold, refugee children will likely need ongoing, targeted support to bridge the gaps in their education and deal with trauma and other mental health symptoms. In response to bridging the gaps and healing the deep wounds of the region associated with trauma and the refugee crisis, media broadcaster SAT-7, launched the educational channel SAT-7 ACADEMY in September 2017. “Through this new channel and the different online platforms bearing our already trusted name, we will provide essential educational services to thousands of families who are in circumstances of considerable hardship. They will be able to access our learning content from any place, at any moment and, soon, through any device,” explains SAT-7 Founder and CEO, Dr Terence Ascott. The overarching goal of this project is to give Arabic speaking parents and teachers in the Middle East and North Africa (MENA) the tools, knowledge and skills they need to create an enabling environment for their children and students to become better, more productive citizens. Doing so will lead to the realization of SAT-7 ACADEMY’s vision of “inspiring impactful, life-long learning across the Arabic speaking world to help build better communities and contribute to the good of society and culture”.